This walk brings you through some of the most beautiful scenery that the Marble Arch Caves Global Geopark has to offer. Follow the geological timeline back through hundreds of millions of years to when the area was under a shallow tropical sea and Ireland lay close to the equator. These walks take you over limestone hills and along river banks into the foothills of Cuilcagh Mountain and one of the wildest places in Northern Ireland. Along the way you can learn about the shared geological history of geoparks from Ireland all the way to Norway and Canada. Keep an eye out for the volcanic Cuilcagh dyke or the disappearing river and if your lucky you might spot some of the feral goats that have roamed these hills for thousands of years. Terrain: Farm Track This route follows the Owenbrean river along it’s course where you’ll notice the wide meander caused by the volcanic Cuilcagh Dyke. Look out for Dippers along the river, these black and white diving birds are a common sight. The trail ends with incredible views of the river valley and the blanket bog of Cuilcagh which is designated as a Special Area of Conservation for its internationally important habitats. Terrain: Track, grass path and bog This trail follows the same course as the Red Route however on the return journey it veers off along the edge of a limestone outcrop passing the ruins of an old stone dwelling before crossing open grassland and bog in the shadow of Gortmaconnell Rock. From Enniskillen follow the A4 Sligo Road West out of the town. Follow signs for Marble Arch Caves. 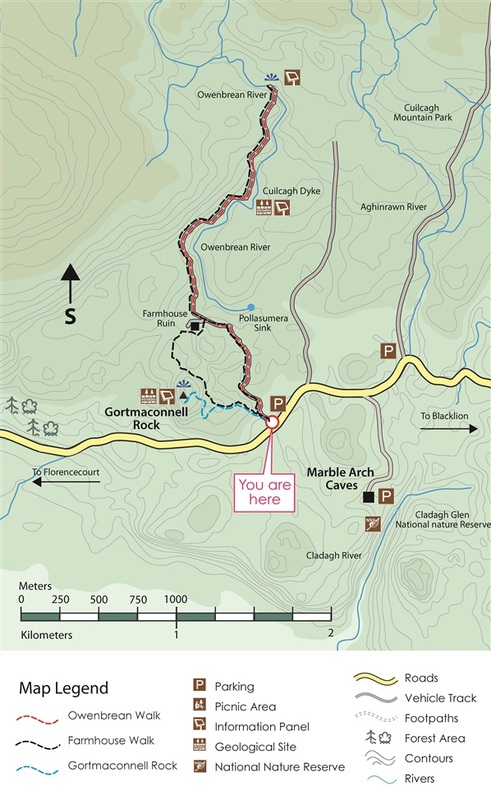 Continue to follow signs for Marble Arch Caves and Marlbank Scenic Route. Roughly 1.5 miles along the Marlbank Scenic Route on the left hand side is a sign for Gortmaconnell. This is the beginning of all of the above walking routes. From Florencecourt follow signs for Marble Arch Caves and and Marlbank Scenic Route. Roughly 1.5 miles along the Marlbank Scenic Route on the left hand side is a sign for Gortmaconnell. This is the beginning of all of the above walking routes.